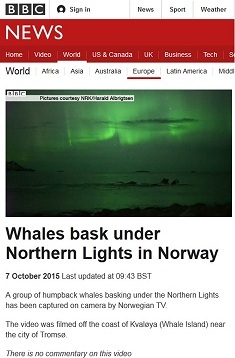 I couldn’t resist blogging about this, I guess, because it was such a beautiful image on the news earlier this week: whales swimming under the northern lights, an image captured by a Norwegian TV station. Click the screenshot, and then I recommend going to full screen display of the video. It’s lovely. Enjoy. Please ask a librarian (chat or email, phone 262.472.1032, or visit the Reference Desk) for help with finding materials. This entry was posted in around the world and tagged Aurora Borealis, beauty, books, ebooks, fun stuff, images, nature, news, Northern Lights, science, web sites, whales. Bookmark the permalink.